The prospects of catching some grown-on trout on this Midland reservoir near Rugby are favourable — with ample cloud cover and light winds on the mild, mid-September morning, the conditions could not be better. 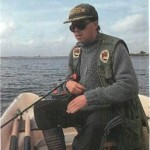 Tony Blakeman from Coventry has fished Draycote for 12 years. He’s equally at home from the bank or an achored boat. 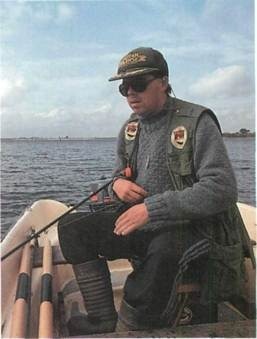 A respected matchman and fly tyer in the fly fishing world, Tony’s biggest grown-on Draycote trout include a brown of 5lb (2.3kg) and a rainbow of 8 1/2 b (3.8kg). Though brown and rainbow trout come close to the bank during the autumn months, fishing from a boat allows you to be more versatile – you can cover more water much faster than the bank angler who has to walk. When fishing with big, heavily leaded lures -especially tandems – it’s important to use a heavy leader of over 6lb (2.8kg) b.s. minimum to reduce the chances of being broken off. Also take your time when tying knots. The trout often slam into the flies, and break-offs are common. 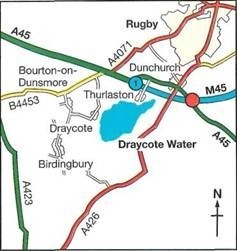 By car Draycote Water, Kites Hardwick, Dunchurch, Rugby, is located just off the M/A45. From the M/A45 take the A426 south towards Southam. Follow signs for Draycote Water – Fishing Lodge. 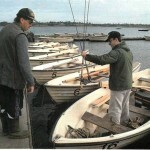 Though lures do well at Draycote, small dries (such as Shipman’s Buzzers, Hoppers, Silver Invictas and damsel nymphs) and traditional wets fished from a drifting boat can be effective. Big nymphs fished from the bank also pull their fair share of trout. Taken off Croft Shoal (with Middle Shoal in the background), a super-fit rainbow temporarily takes flight, trying desperately to shake the hook, only to crash-land back into the water. When the surface of the water explodes time and time again, you can bet you’ve hooked a rainbow trout. They usually fight their battles in the top few feet of water. Tony safely stows a stockie rainbow. 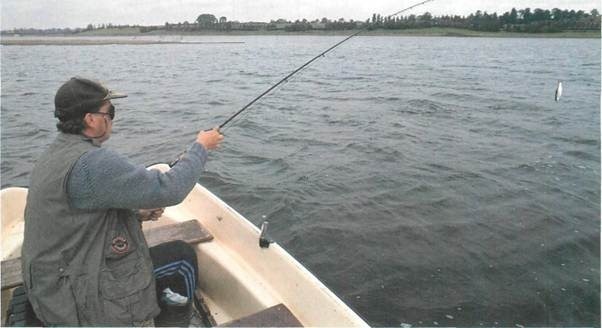 You don’t have to keep every fish you take – catch-and-release is permitted on Draycote Reservoir, but once you have killed your limit, you must stop fishing. Tony with a batch of rainbows in the foreground – don’t think this style of fishing only catches rainbows. Browns also take big lures. 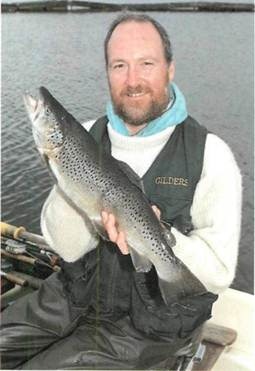 Grown-on browns such as this five pounder (2.3kg) and quality stock fish lure anglers to Draycote all season long. 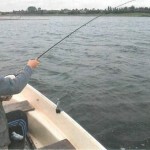 Draycote Water offers full day (eight fish limit) and part-day (five fish limit) tickets to boat and bank anglers. Rowing and motor boats are also available. Once loaded, we head out to the Middle Shoal – a sunken island when the reservoir is at its normal level, but now exposed. It’s in the middle of the reservoir and is known (it’s the same as ‘leader’ line, just as good and much cheaper, says Tony) and begins fishing. He has full confidence in his fly. It is one of the most inventive lure styles to hit the Stillwater scene in a long time. 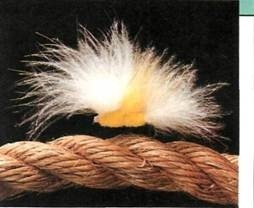 Tied on longshank Kamasan lure hooks, with an amazing 72 turns of fine lead wire, the fly sports three marabou wings, a beefy marabou tail and a chenille body. 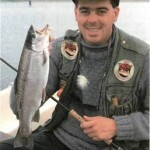 He ties the lures in proven trout-attracting colours – white, yellow, hot pink, lime green, red and orange and many combinations. As expected, they sink very quickly, and the marabou pulses like a hula dancer. What more could you ask for in a lure? In addition, when the fly sinks, the body stays horizontal to the water’s surface (unlike a Dog Nobbier, for example, which plunges in head first). This helps the wings and tail to nutter enticingly as the fly descends in the water, and you get a lot of fish on the drop (as the fly sinks to the required depth). 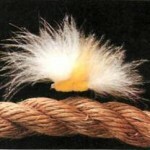 When you begin retrieving, the vast amount of marabou feather comes alive. The slightest pull of the line registers on the wings by making them quiver with life. Tony’s tandem flies are basically two identical patterns linked with 20lb (9kg) mono (a 40-50lb/18-23kg link would be stronger, though). He blasts out the Wet Cel II shooting head, waits a moment and begins stripping the line fairly quickly. 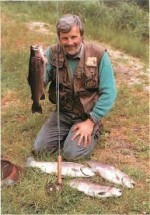 Long casts are important in this style of fishing. 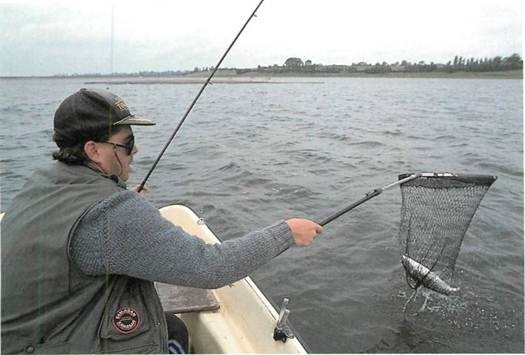 You need enough distance to persuade sceptical trout to take. 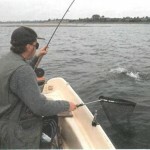 Short casts can often result in many follows – especially in mid season when the trout have seen a lot of flies, but the show’s duration isn’t quite long enough to convince a wary fish to take. So, for long range work with big, heavy lures, Tony prefers to use a shooting head with yellow 20lb (9kg) Amnesia running line instead of a full WF line. The low diameter Amnesia flows through the rings easily, enabling him to cast much farther and much easier than with a WF. He uses a needle knot to connect the running line to the fly line. The DIY shooting head is 3.65m (4yd) longer than a shop-bought one. To cast, all you have to do is aerialize the fly line so that the running line is just outside the tip ring, and then let go — consistent 30m (33yd) casts without too much work. 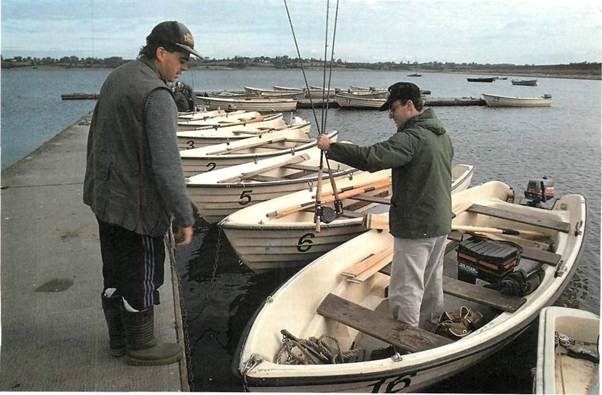 Tony changes to a Blakeman’s Cat Tandem and works the area, using a variety of retrieves – figure-of-eight, strips and hand-over-hand—to bring the fly back. 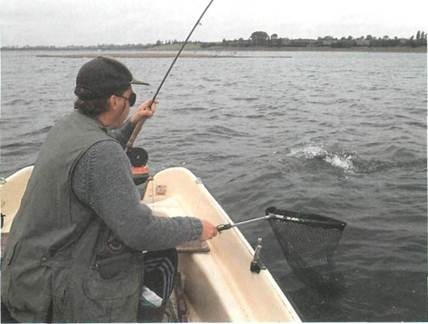 As the lure comes back up to the boat, he pauses (just in case a trout is following out of sight) and then strips in quickly to incite a strike. Nothing. He lifts off by roll-casting and recasts. It’s easy to fail to concentrate at the end of the retrieve, arguably the most critical (but often ignored) time. Countless anglers thoughtlessly picking their line off to recast have seen and heard the splash of a spooked trout turning down. Pausing, then speeding up, often convinces a following fish to take; the trout may believe the prey is getting away and hit it as it races upwards. 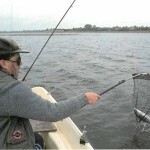 Tony makes yet another long cast towards the Middle Shoal. 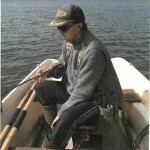 After two retrieves the line is almost wrenched from his hand as a trout wheels out to deep water. After a long struggle a beautifully conditioned 2’/2lb (1.1kg) rainbow comes kicking into the net. With one in the bag, Tony casts into the same area. 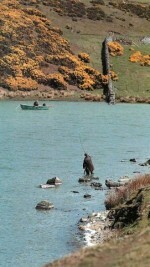 He reckons the depth is about 3.6m (12ft), and the trout are about 1.8m (6ft) down. In rivers trout don’t suspend in mid water — most of the time they’re at the bottom. Sometimes you find they’re just below the surface, taking hatching insects. 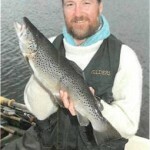 In stillwaters, however, trout (and other fish, for that matter) often suspend, depending on the water temperature, amount of oxygen present and light intensity. Tony fishes on for another 30 minutes without taking any more trout. He tries a floating WF and Orange Muddler – and gets plenty of follows but no takes. We move to the nearby Croft Shoal, and after only a few casts Tony is in with some quality rainbows around the 2lb (0.9kg) mark. The fish are taking right after the first few pulls. 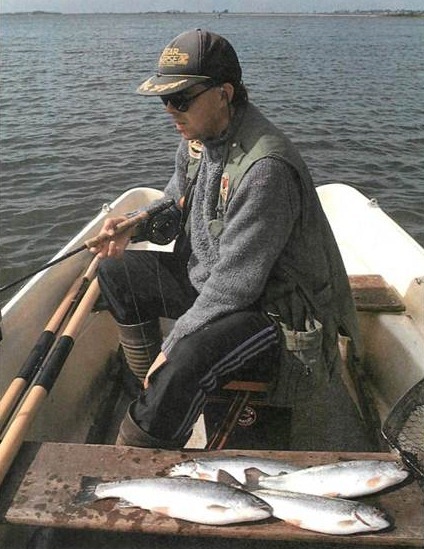 He catches a couple more and then decides to move to Farborough Spit in the hope of latching on to some really big trout over the 4lb (1.8kg) mark. Tony drops the anchor about 60m (66yd) from the Spit. The water here is 6m (20ft) deep with a boulder bottom. 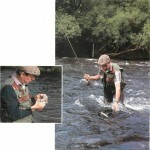 Big browns and rainbows patrol the dam wall (all along Toft Shallows to Toft Bank), searching for fry. ‘A lot of roach congregate here, and there’s a hole which drops off to 30ft off the spit,’ he says. From the Spit, the trout turn northwest towards the Middle and Croft Shoals before moving into Toft Bay and completing a large circle. So the Spit is a key turning point for big fish. With a big Blakeman’s Cat Tandem, Tony explores the area thoroughly. But after 45 minutes, with only a few follows from stock fish, he decides to pack up and move to another mark – if the fish aren’t there, it’s no use sitting: you could wait there a very long time. Judging from the success of fishing along the shallow marks, he decides to fish near the Sailing Club. The moored boats and pier are prime fry-attracting areas. The water temperature near’ the bank is much more bearable for trout in the autumn, and they come close to search for roach and perch fry. Fishing from the bank is not allowed along the Sailing Club, but it is permitted from a boat as long as you stay 50m (55yd) from the bank. Tony begins casting towards shore and right away is in with a good-sized rainbow. After landing the trout, he moves parallel to shore. A trout splashes on the surface nearby. Peter Gathercole covers the fish immediately with a Blakeman’s Yellow, and it takes. Once it feels the hook, it goes berserk, steaming off towards the jetty and then cartwheeling across the water. 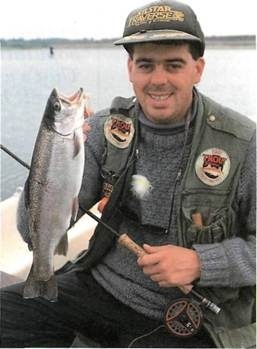 When Peter finally lands the trout, he spoons it, finding a gut-full of small, half-digested perch. After a brief spell at Hensborough Bank -with one ferocious pull which broke Tony’s leader – we move back between the Middle and Croft Shoals. We park there for a two hour stretch, taking a limit of middleweight rainbows (eight fish) on the big lures before calling it a day.